The Amazing 100% Soft Clench Guard! The perfect Daytime Guard to Complement traditional Nighttime Brux Guards………..
MINI COMFORT, has developed and PATENTED (U.S. patent # 8,826,913) a Damage Preventative System that BECAUSE OF THE 2 DISCLUDING ELEMENTS, combats the destruction of teeth, dental caps, dentures and other dental work caused by Bruxism. As Shown in the picture, and as the name implies, the MINI COMFORT is small, soft, and extremely Comfortable and prevents any damage that may be caused by the clenching and grinding of teeth. 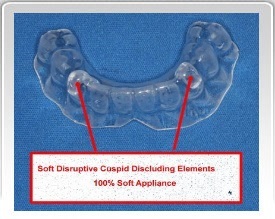 The Science of this 100% Soft Lower Guard is based upon the long standing doctrine and understanding of Cuspid Discluding principles that naturally protect dentitions. (Please see Dentist FAQ for further info). Any violation or infringement of Mini Comfort Patent #8,826,913 will be vigorously prosecuted. IS PRACTICALLY INVISIBLE AND CAN BE WORN AT WORK OR IN SOCIAL SITUATIONS. DOES NOT REQUIRE A ‘GETTING USED TO” PERIOD. DOES NOT INTERFERE WITH SPEECH. CAN BE WORN WITH VIRTUALLY ANY TYPE OF RETAINER. IS CUSTOM FABRICATED FOR A PERFECT FIT. DOES NOT REQUIRE TIME CONSUMING ADJUSTMENTS. DOES NOT INTERFERE WITH SLEEP. CAN BE WORN WITH A CPAP BREATHING MACHINE. THE MINI COMFORT IS THE MOST USER FRIENDLY CLENCH GUARD ON THE PLANET. Copyright © 2014 Minicomfort.com. All Rights Reserved.